A place for me to talk about cooking, travel, and more. My little boy just turned 5 years old (yesterday) and really wanted a rainbow cake for his birthday. I found a great design and some helpful tips from Bakerlady. 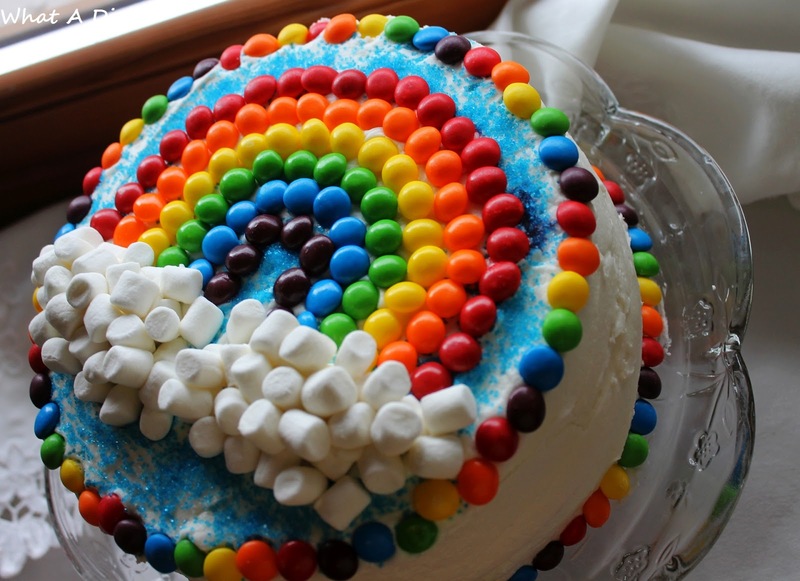 For the inside, I just used a homemade yellow cake (instead of making colorful layers from boxes mix like she did.) 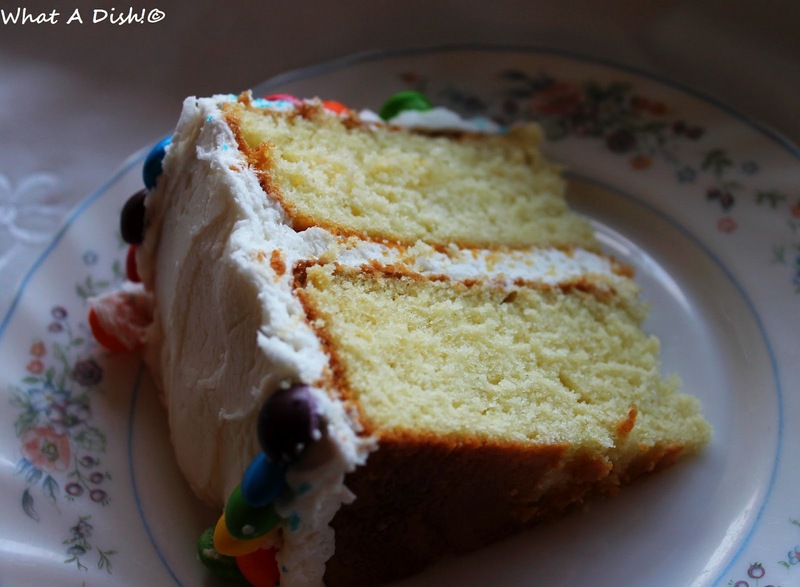 I actually used my new favorite recipe for yellow cake, and it comes from Joy the Baker. It's super easy and uses buttermilk. This is the third time I've made it in about six months. I made a 9x13 with it back in February. To make this, you frost the cake white (you can do a crumb layer first- pic above is frosted with crumb layer). 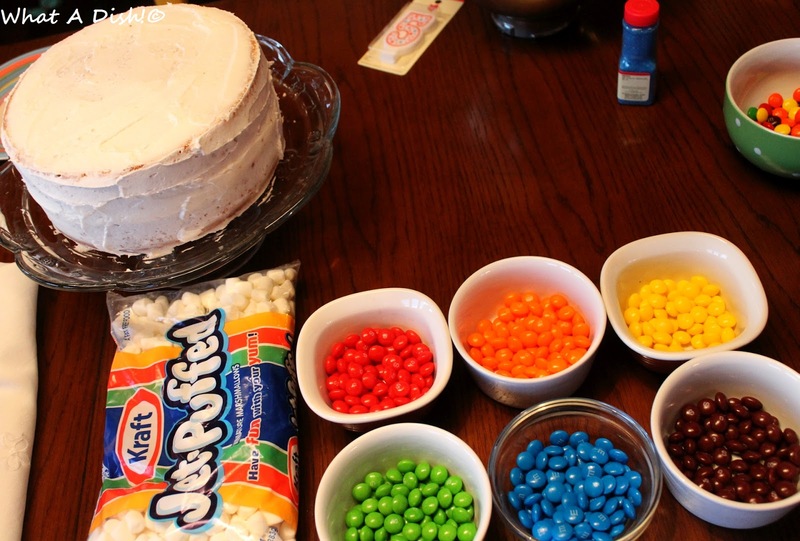 Use skittles for all the colors, except for blue- use M&M's. Take a few minutes to separate everything into little bowls. Print out this rainbow coloring page and outline it with white icing (in a plastic baggie with the corner cut off). 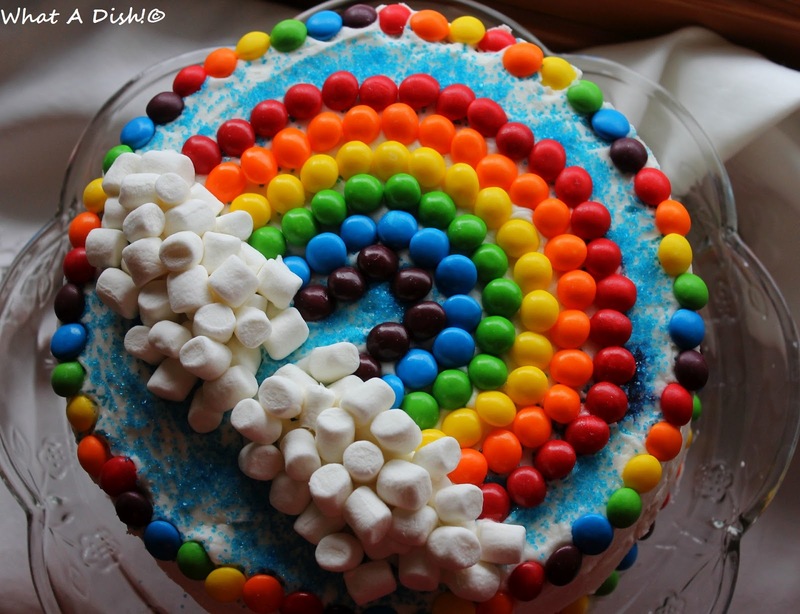 Turn it upside down onto your cake so the icing sticks onto your blank cake, and you can use the candy to form an even rainbow this way. Use white frosting to stick on mini marshmallows for clouds. 2. In the bowl of a stand mixer fitted with a paddle attachment (you can also use a large bowl and electric hand beaters) cream together butter and sugar until light and fluffy, about 3 to 5 minutes. Stop the mixer and and scrape down the sides of the bowl. Beat in the eggs, one at a time, beating for 1 minute between each addition. Beat in vanilla extract. 3. In a medium bowl whisk together flour, baking powder, baking soda, and salt. Add the dry ingredients all at once to the butter and egg mixture and beat on low until just combined. Add the buttermilk and beat on low for 1 minute. Increase the speed to medium and beat for 30 seconds more. Pour batter into prepared pans. Bake for about 25 minutes or until cooked through and the top springs back lightly when touch. Test the cake by inserted a skewer into the center of the cake. Cake is done when just a few crumbs are left on the skewer. 4. Remove from the oven and allow to cool for about 30 minutes. Remove the cakes to a wire rack to cool completely. Let cool completely before frosting. 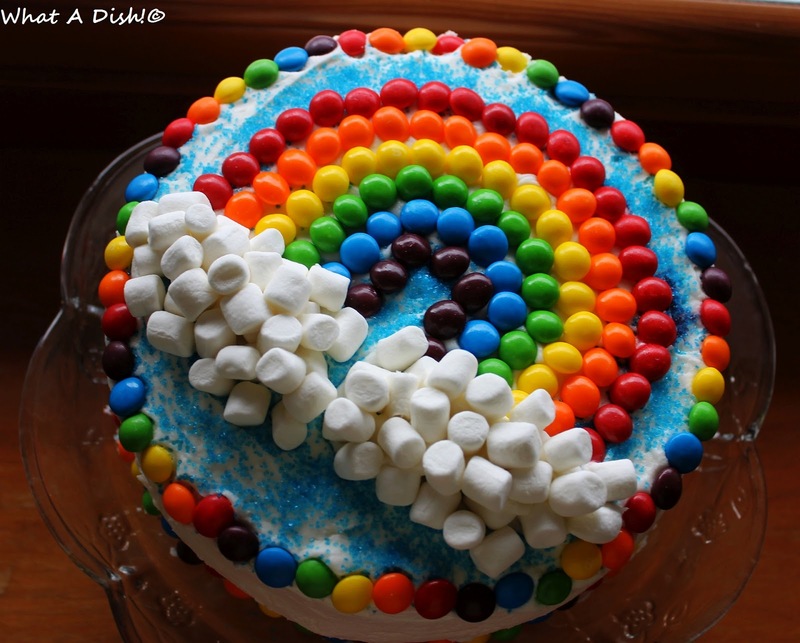 *You can also make this cake in a greased 9x13 pan. 1. In a stand mixer or a hand mixer, cream butter. Add sugar, vanilla extract, and milk, whipping until smooth. Beat for a few minutes. You can add more powdered sugar if needed. I actually used 2 lbs so I'd have enough frosting, but it was really sweet. 1. Frost cake white, with frosting in between layers. Sprinkle blue sugar on the top. (Or frost it blue, or use that spray paint frosting stuff.) Separate Skittles into bowls by color, and separate out all the blue M&M's. Using this coloring page, outline (with white icing or gel) the rainbow. 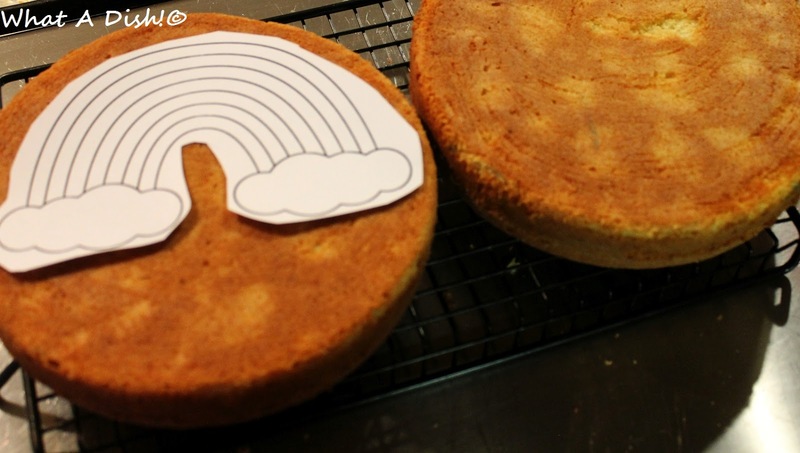 Turn it upside down onto the smooth surface on top of your cake. Use this as a guide to form your rainbow. Starting with red, then orange, then yellow, then green, then blue, then purple. Then, pile up mini marshmallows on the bottom of it for clouds. Use white frosting to help them stick. 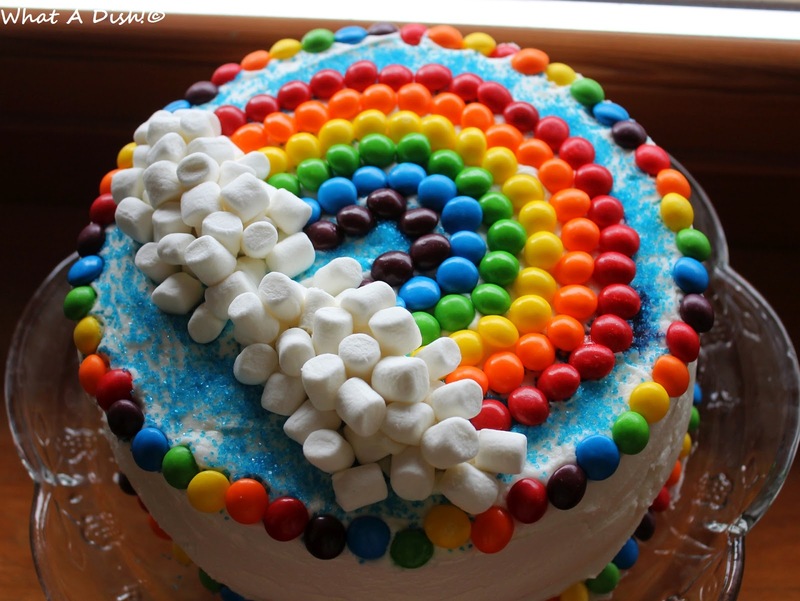 With the leftover candies, make a border around the top and bottom of the cake. You can do the same color pattern- red, orange, yellow, green, blue, purple. I love living overseas- I've now spent over half my life living in other countries! I love food and travel. I hope you will enjoy the recipes and photos I share with you. If you have questions, (nice) comments, or feedback about a recipe or something else, I'd love to hear from you! Look at the gnocchi goodness. ©What A Dish!. Ethereal theme. Powered by Blogger.